Soccer team FC Cincinnati is embracing its new identity, announcing it is officially becoming Football Club Cincinnati as it enters Major League Soccer. The main colors remain blue and orange with navy accents. The club says the new orange and blue aim to "pop" more than the original ones. The team will still be known as FC Cincinnati, though it is switching from the Latin American/Spanish moniker "futbol" to the more traditional English "football." "We are an American city; we are in an American league; and it's cleaner, and we believe more appropriate to say 'We are Football Club Cincinnati' as a brand," says General Manager Jeff Berding. "When we proclaim who we are, we are Football Club Cincinnati. Football. The biggest sport in the world." Berding says "football" was chosen over the Germanic "fussball" some expected because it's "the world's sport." Berding says a new brand is important because the previous one represented a different time for the team. "The previous identity was our USL identity and we've said goodbye to the USL. We're now a first division club. I think we've stayed true to our original identity but we've updated it. In our original identity, "FC" was the most prevalent part, now "Cincinnati" is the most prevalent part." The emblem, referred to as a "stabby lion" or "knife-y lion" by many fans, remains, but is updated to a more regal, angular design with harder lines. "A lot of effort went into this rebrand," says Berding. "This consumed our staff this summer." He says fans told the team they wanted to keep the lion "so we made it a little stronger, a little fiercer. It sort of represents the 'king of the jungle' and we want to be the king of MLS." Consulting firm Interbrand developed the new logo and "visual brand identity." Its previous work includes the Winter Olympics in Pyeongchang and Sochi. "We wanted a crest that didn't look like anything else in the MLS," says the company. The crest shape is pulled from architectural elements around the city, as well as the traditional panel of a soccer ball. "I think the new logo and the new brand captures the best of our old logo and what we were so successful with, but I think it's even better now," says Majority Owner Carl Lindner III. "The cool thing about the logo is that every aspect of the logo has some meaning." FC Cincinnati enters MLS as the league's 24th member. Clothing and team gear featuring the new branding goes on sale Tuesday at 10 a.m. in the FC Cincinnati Team Store on 4th Street, Downtown. The new FC Cincinnati crest was developed as a representative of the city. Inspired by Cincinnati – itself a city on the rise – the crest highlights the region’s German heritage in a modern manner. The winged lion has been carried over and has taken a more prominent place on the shield. It is bolder, stronger and ready for battle. It represents the club’s winning spirit, while its crown pays homage to the Queen City. The seven points on the lion’s mane represent the seven hills of Cincinnati, while the wings’ three feathers highlight the club’s three-year journey to MLS. Curved into a “C”, the lion’s tail is another nod to Cincinnati. The team’s new wordmark is a familiar update on the team’s original mark. 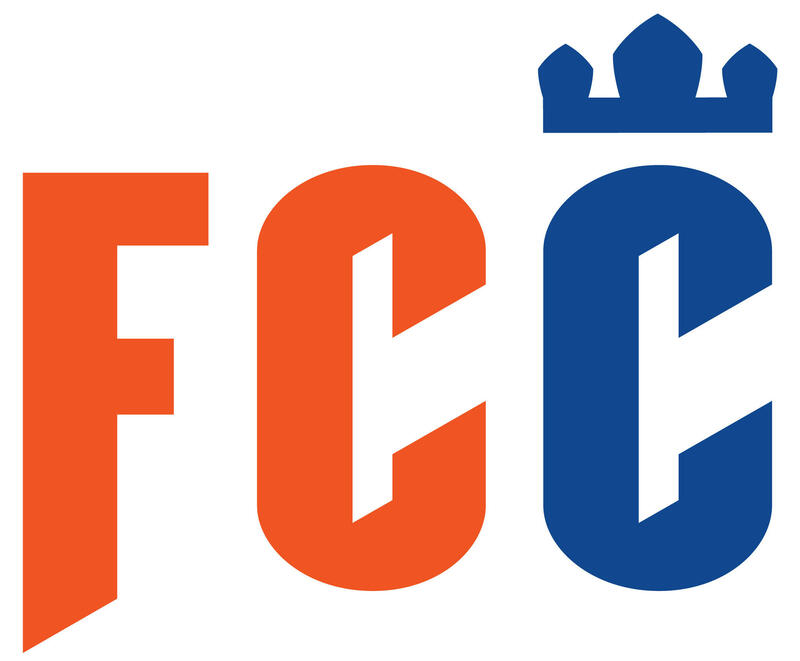 Still an orange and blue combination on FC Cincinnati, the crown remains firmly affixed atop the “C” in Cincinnati – again, a nod to the Queen City. Written straight out with no breaks or punctuation between letters, the FC moves straight into Cincinnati to show the club’s direct connection to the city. The club’s new secondary mark is the stylized FCC from the full wordmark, while stand-alone tertiary elements will eventually include the full lion from the crest, the lion’s head and mane, and the crown. Those elements will be introduced more prominently in future years as the brand gains traction in the marketplace. Tuesday, Nov. 13 – Fountain Square, 11:30 a.m. to 1:30 p.m.
Wednesday, Nov. 14 – Cincinnati Zoo, 11 a.m. to 1 p.m.
Thursday, Nov. 15 – The Banks (Anderson Pavilion & Carousel), 11:30 a.m. to 1:30 p.m.
Friday, Nov. 16 - Findlay Market, 11:30 a.m. to 1:30 p.m. and Laurel Playground, 3 p.m. to 5 p.m. Fans will finally get to see what FC Cincinnati will look like as the team heads to Major League Soccer next year. The soccer club unveils its new branding during an invitation-only event Monday at 6 p.m. The construction company selected to build FC Cincinnati's West End stadium is laying out a timeline for the process. Turner Construction released initial plans Friday.